Google Drive is Google’s cloud service that enables you to store and synchronize your files for easy backup and access from multiple devices, such as your desktop computer, your smartphone, and your tablet. You can also use Google Drive to collaborate with others, sharing documents and allowing others to edit them in real time. To begin using Google Drive, you need to set up a Google Drive account at drive.google.com. Fill in your information and click Next Step (see Figure 1). On the Welcome screen, click Back to Google Docs, which takes you to your Google Drive. 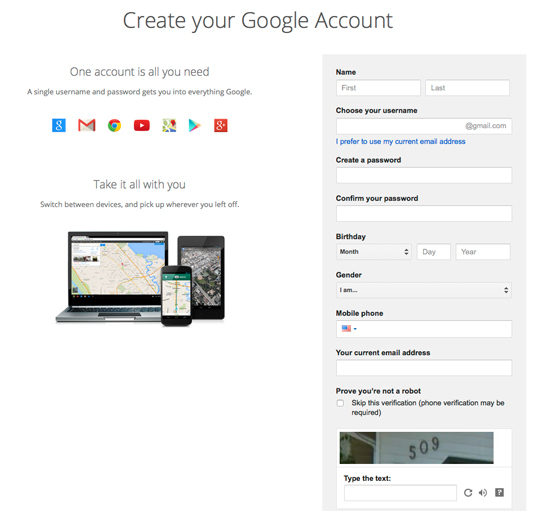 Figure 1: Fill in your information to set up your Google account. The account you just set up enables you to access all of Google other applications, such as Gmail, YouTube, Google Maps, and Google Calendar. What can you do with Google Drive? The benefits you get from Google Drive depend on how extensively you use it. You can use Google Drive simply to back up your files. Your free account comes with 15GB of free storage, and you have the option to buy more storage for a few bucks per month. Just upload your files from your desktop computer to your Drive for safekeeping. Or download the Google Drive application to automatically synchronize your files to your Drive. You can take it a bit farther by downloading the Google Drive app to your smartphone or tablet. The app enables you to view, share, and print your documents from anywhere you take your device. You can also scan documents with your phone or tablet’s camera and upload them to your Drive. But Google Drive isn’t meant just for storage. To get the most of your Drive, you can use it as a productivity tool, such as a word processor, a spreadsheet program, a slideshow program, and even a drawing program. This is great if you don’t want to shell out the money for software, because these Google apps are free and have the basic functionality that most people need. The documents you create are stored on your Google Drive, which you can view from your computer or other devices. If you want to get really fancy in using Google Drive, you can use it to collaborate with others. For example, say that you’re creating a document that needs input from several different colleagues. You don’t have to e-mail that document around for updates and then try to make sure you’re using the most up-to-date version. You simply start your new document on your Drive and then share it with your colleagues. Depending on the permissions you set up, your colleagues can either view the document only or edit the document. There is only one document, but many people can make changes to it (even at the same time). Try this: Say you’re meeting with colleagues and brainstorming ideas for something new. Open a Google Drive document (a word processing document or spreadsheet) and share it with the others. Use the document as a virtual whiteboard to take notes of your brainstorming session. Or allow the others to update the document with their own ideas in real time, which everyone else in the meeting can see. This can be especially handy if your colleagues are in different locations. Keep in mind that when you share a document on Google Drive, those you share it with can see any and all changes you make, and if you give them permission, they can change the document as well. So make sure you’re giving permission to people you trust!